About - Lakefront Exteriors Inc.
Lakefront Exteriors Inc. was founded in 2004. We are a small company specializing in eavestrough/gutter, leafguard, soffit/fascia and siding installation. We have over 13 years of experience and guarantee a better quality of workmanship then any big company out there. We are a family operated business and we treat our clients like family. We are meticulous and take great pride in our work. We ensure that the job gets done right and in a timely manner. We blend the personalized service of a small, family-owned business with the professionalism and high standards of a larger company. Our reputation is your guarantee! Improving customer’s homes since 2004! Lakefront Exteriors (formerly known as Gutter Gurus) was founded by Danny Bojat and Darko Vrbat in 2004. Back then, we specialized in seamless eavestrough installation. Danny and Darko grew up and went to school in the Etobicoke, Lakeshore and Long Branch area. 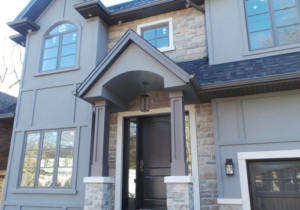 In 2008 we were primarily working on new construction projects in the GTA. Great Gulf Homes, Arista Homes, Greenpark Homes and Mattamy Homes are just some of the builders we did work for during this time. Working on hundreds of new construction homes gave us great experience, and furthered our skills. In 2012 our team grew and we expanded to two crews. With a larger team we were able to start working on custom renovation projects, as well as basic residential projects. 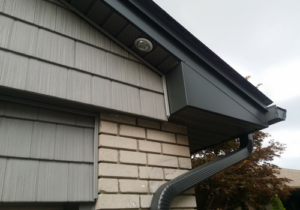 We started installing soffit, fascia and siding to offer a complete aluminum package. In 2015 we switched our focus to residential renovation projects. We felt that new construction did not take quality into account, and we refuse to lower our quality to produce quantity. In 2017 we re-branded the business to Lakefront Exteriors, and got a new logo. We started creating a trusted company that is known for its quality and service. Contact us today to get a quote for your project. Our commitment-free consultations will let you know what we can do for you.